The Snooze Button Generation 2019: Where have all the Crispin Glovers gone? As Crispin Glover's foot nearly struck David Letterman's face, a shocked and disturbed feeling swept over me while I couldn't stop staring at the TV screen. ... Yeah, man, that was entertaining! 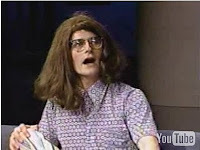 Crispin Glover's 1987 "performance" on "Late Night with David Letterman" is among the most memorable talk show moments to me, and as I reminisce about him threatening Letterman and acting like an eccentric goofball, this question comes up: Where have all the good talk-show guests gone? A good, controversial talk-show guest should 1) entertain and 2) make the talk-show host feel uber-uncomfortable. Blending those two factors appears extremely difficult because, often times, No. 1 is lost due to No. 2. Glover did both, though, and Letterman stormed off the set, muttering "I'm going to check on the Top 10." 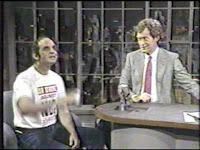 Cleveland native Harvey Pekar did something similar, but Letterman enjoyed him. Plus, Pekar perhaps was more critical of General Electric, NBC's parent company, than Dave. Pekar made eight appearances on "Late Night," even though G.E. briefly banned him from the show. 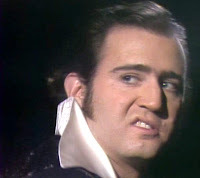 Andy Kaufman was arguably the first, and best, controversial talk-show guest. My only criticism is that his unconventional antics became expected, and often times, his appearances looked too pre-staged. They were still highly entertaining, but Letterman and other talk-show hosts were at ease with him. So, are there any good controversial talk-show guests nowadays? I don't think so, though Joaquin Phoenix recently made a captivating, controversial appearance on "Letterman" not so long ago. Late night TV is dead to most in the Snooze Button Generation because it's failed to develop in accordance with our technology and viewing tastes. Seriously, if someone in the Snooze Button Generation regularly watches late night TV it is because of one of three reasons - 1) routine, 2) that person has somehow failed to discover better entertainment options or 3) nostalgia for Letterman's best years from 1982 to 1993.